Unique Tier 4 Final Technology! Our midis meet Tier 4 Final regulations without the need for a Diesel Particulate Filter (DPF). This means no need for filter regeneration, no fuel used to burn particulate matter and no need to replace an expensive DPF. Emissions are miminised by cutting fuel consumption with an efficient common rail engine and an advanced variable control Cooled Exhaust Gas Recirculation system. Then, a Diesel Oxidation Catalyst (DOC) reduces the pollutants in the exhaust gas through a chemical reaction. The DOC does not need to be replaced; it lasts the whole machine’s lifecycle. This system is highly efficient and very simple. 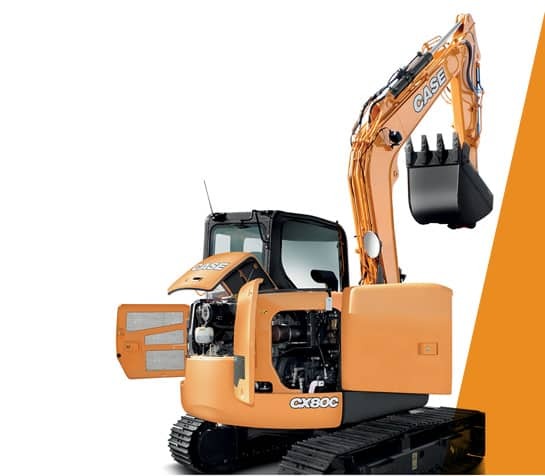 The CX75C and CX80C have the same cab as larger CASE excavators, which means plenty of room for legs, feet and arms, adjustment options for the seat and control levers, and features usually found on higher category machines. The joystick lever to travel lever clearance has been increased by 31%! The short tail and front swing radius design make C-Series mid size excavators the best solution to work efficiently in confined spaces. The compact design minimises disruption in urban and road jobsites, as well as the possibility of hitting something when swinging the upper structure of the machine. The smooth and round shape design of the new cab was studied for maximum reliability and functionality. CX75C SR can work in a space of less than 3 meters wide!